Rochester Diocese has a link with the Diocese of Harare in Zimbabwe. Our own particular link is with St Phillip’s Church in Tafara, on the outskirts of Harare. It began in 1985 when to celebrate the 650th anniversary of St Margaret’s it was decided to raise £10.000 to complete the Church building in Tafara. In 1994 a party from St Margaret’s visited St. Phillips Tafara Since that time the link has continued, although at times communication has been difficult due to the political situation in Zimbabwe. Amongst other projects we were able to help finance the garden project by Widows and Single Mothers at St Philip. They were able to connect the water to the Rectory and finalise some repairs. This enabled them to embark on the youth; garden , fish and chicken rearing projects with the youth agreeing to spruce up and landscape the surroundings. Revd Judy visited St Philips with a party from the diocese led by Bishop Brian. She stayed initially at the home of the priest of St Philip’s, Canon Phineas Fundira, discovering that many of the things we take for granted, such as regular electricity and running water, are not always available to our fellow-Christians there, but they rejoice in sharing what little they do possess, and make their visitors very welcome. Revd Judy was asked to preside at the next day’s service the first woman priest ever to do so, but all made her feel very welcome. Services are normally in Shona, but for Judy’s benefit on that day, most of the service was in English, except for the hymns. Revd. 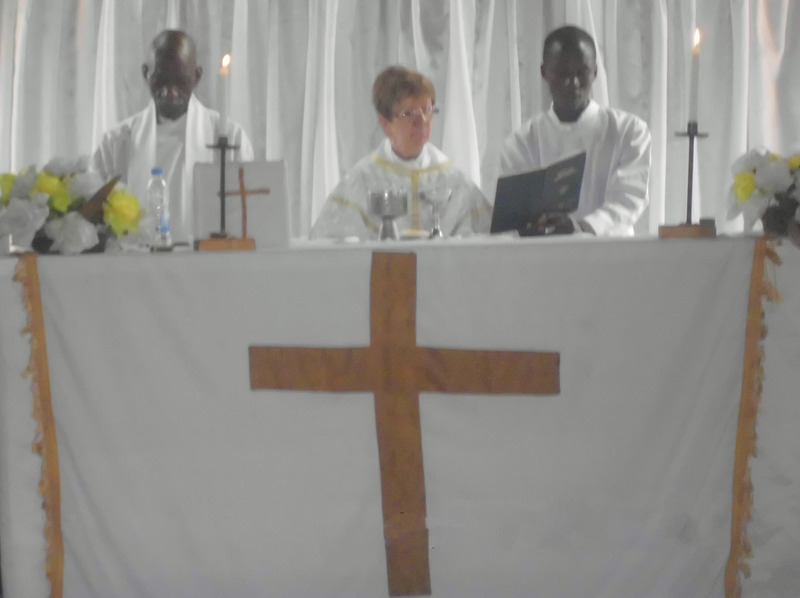 Judy celebrating the Eucharist – Canon Phineas Fundira is on the left of the picture. Fr. Wisdom from St Phillips was able to visit St Margaret’s whilst on a trip to the Diocese recently. Please continue to remember in prayer the people of Zimbabwe particularly St. Philips Tafara and St. James Mabvucu. I would like to notify you that we lost one of our subdeacons on the picture with a purple shirt, Mr Maxwell Kadzviti. He passed away last month. Please remember him in your prayers.